I got busy lately here, I have a very special person who just visited me and came the way here to meet me personally and ... [dont want to mention] hehehehe..
Jan. 24, 2007: Jeffrey Hedges from New York State came all his way in General Santos City, Philippines to meet me for the very first time. Yes, he is my boyfriend, were we meet @ person.com website. We started to get friends, I'm there for him to share things with, until such time we both liked each other more and we both decided to make our relationship go deeper. We have bad times sometimes, but that is all part of the relationship, its not that easy to have a long distance relationship especially when you haven't meet yet. Moreover, I met him with wella and mistica with me at Davao Airport. I feel comfortable with him, his actually cute I admit that...hehehe..then we headed to take a hotel for us to stay, and joined wella and mistica for the itenirary for that day.We went to Gaisano Mall to buy some stuff, Crocodile park, and dinner at Jack Ridge. 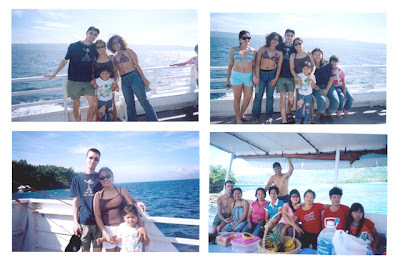 Jan. 25, 2007: Island hopping, we were at wind and wave shop at 8am and waiting for my whole family there. 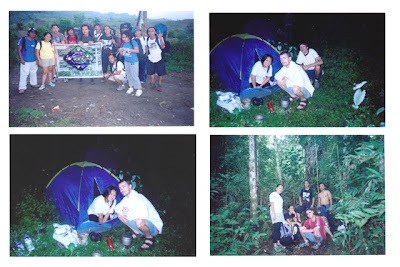 They met for the very first time, Mom, Kuya, in-law, Friends and Aunties. 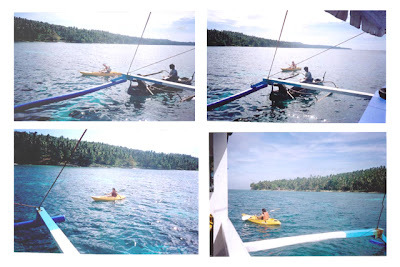 Lots of fun, everyone is shy to each other at first, but when we stopped at one island for our kayaking, scuva diving, snorkling, everyone were laughing, smiling, excitement, and enjoyed. Jan. 26-28, 2007: 3 days and 2 nights to climb. 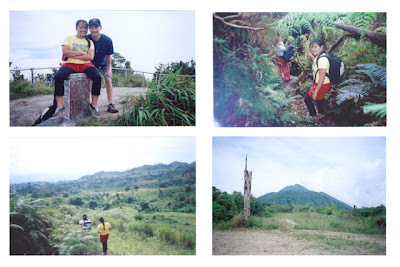 We were on the top of Mt. Matutum at Jan.27, 3pm.. 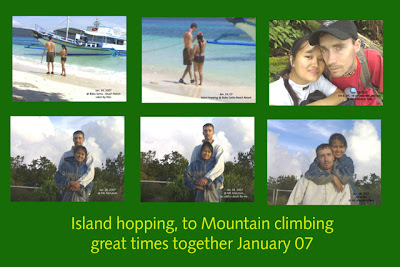 I have a very unbelievable experience, with my Mahal with me of course, I was really nagging on my way up? and down...hahahaha..I was nagging and wishing that I did not joined the climbed, after all those stupidity that I have made there? I got proud of myself, because I got back down safe and sound and with Jeff with me too. 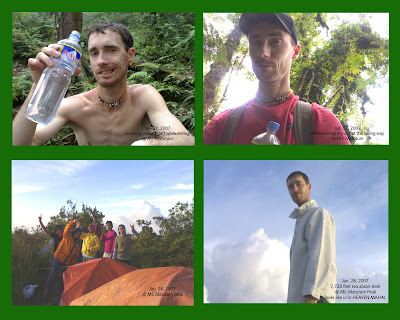 He love that way, so much fun, chillin up there, the challenging branches, trailways and the unexpected trek..WOW...we also have a very good mountaineer who were there for us, makes everyone happy and they do also enjoyed it, even if they were with some foreigner with them to join the climb. All I can say, probably I'll try Mt. 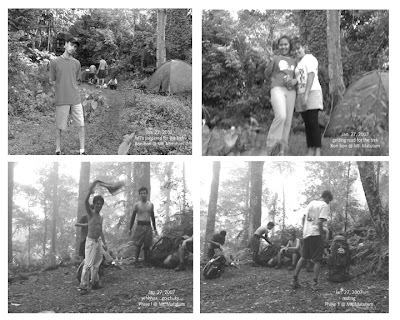 Parker next time, but with a preparation for it, maybe next year...hehehe..I have sweared I will never climb back to Mt. Matutum again..
Jan.29, 2007: We stayed at home in the whole morning, I have to gain my strenght back, we went to tropicana beach resort, had dinner at Twinkle's place and met Jeff with twinks family, had bowling and ended up at 12:00am. Jan. 31, 2007: We have to spend time together, he'll be leaving GenSan the last plane flight, he insisted me to go with him in Manila, and 2 hours before our flight we were all rushing, we were almost left to our flight. And Jeff were totally scared he can't be in Manila before his flight back to the U.S. I scared him but we actually did get there. 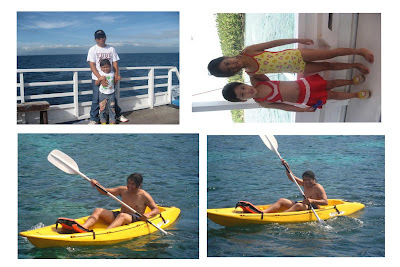 My sister met Jeff there, we went to MAll of Asia, took some pictures, and went to the Bay Walk, at least it gives us 12 hours to spent time together before he actually have his flight back. At 7:50am he flew, tears were running down our eyes bidding bye for now, because we have to go on with our lives. I miss him badly, everyday that we were together gives me a hard time to recover, but I have to be strong, and he did the same thing too.